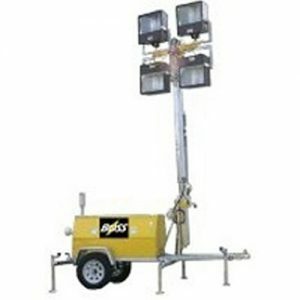 PORTABLE ELECTRIC POWERED LIGHT TOWERS DIVISION 2 can be operated off of utility 480v, 208v or 120/240v electrical, clients options. Both these towers can be UL Certified under UL1640 Standard either as Class 1 Division Division 2, Groups ABCD. These types of electric powered light towers are used for offshore, inland oil and gas industries, industrial applications used within battery units and environmental waste containment areas. Units can be powered by a portable standby diesel gen-set that has be to positioned outside of the classified area. Power cord would have to be ran to light towers to supply operating power. Most electrical power light towers use a standard 60a, 480v, 3p/4w welding receptacle found commonly in most industrial plants. Bossltg is a UL Certified Portable Explosion Proof Lighting and temporary electrical power distribution assembler. 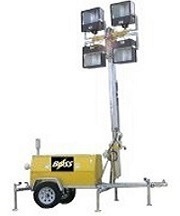 It is under the UL1640 Standard that UL allows Boss to Certify these Electric power Hazardous rated Light Towers. 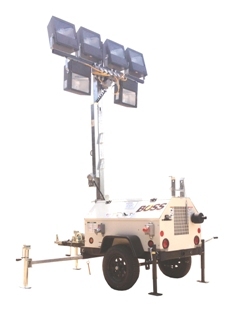 Hazardous Environment Design Light Tower 8kw – 6 – 1000w Metal Halide Floodlights, Division 2 Floodlights, Division 1 plugs and receptacles, Emergency Shutoff Valve, Spark Arrestor Muffler.